Thank you very much for your interest in Public Administration, Innovation and Russian Civil Servants. Gorky Park is an excellent location to talk about Innovation and Civil servants. 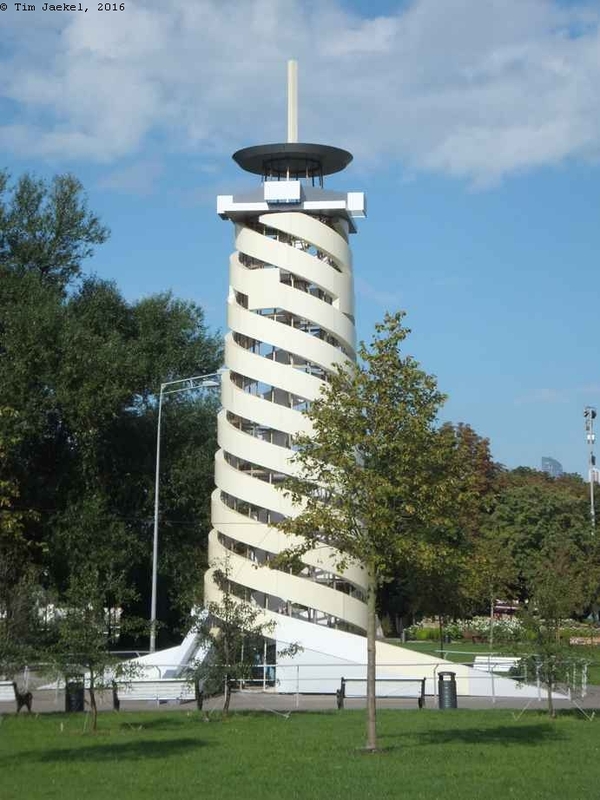 Just have a look to the marble-colored twisted tower (pictured above). When I saw it for the first time two weeks ago, I initially thought it was a new look-out platform. I was really excited, took my camera and raced over there – just to learn that you cannot climb it up. Залезать на Башню – нельзя! From a plate nearby I learned that actually this is a mock-up model of a funfair attraction from the 1930ies. 80 years ago bold ordinary Muscovites did parachute jumping from the platform at the top. There were three pre-installed parachute – so it assumed the name Three Parachute Tower. According to some sources this Soviet bungee jumping became one of the major attractions in Gorky Park. I do not know what happened to the tower after the Great Patriotic War. But in 2015 a mock-up model was put in front of Gorky park main entrance as a New Year’s Three. And people liked this very special Ёлка. This anecdote about three parachutes, a Ёлка and a mock-up model serves as an excellent example of innovative behavior in public administration. It is an example of how Gorky Park managers come up with new ideas of how to offer Muscovites a sound recreational area. The Three Parachute Tower serves as an example of innovative behavior in Public Administration. An innovation is an idea, program, or policy that is new to the organization adopting it (Reference). Innovative behavior means to come up with new ways of doing things. Gorky Park is run by a government agency, Mosgorpark. Another term for government agencies is bureaucracy. By bureaucracy we usually understand the work of civil servants in Public Administration. Public Administration is also a science, a science that explains “what government agencies do, […] why they do it” (James Q. Wilson 1989), and how they do it. The job of any government agency is to do something: Public Administration and civil servants are providing public goods and services. We need such services like law enforcement, public transport, or parks, so we are in need bureaucratic organizations. We are need of coordinated activities of public officials because a single individual usually cannot provide a public service for a large community own its own, even if she is the most intelligent person with a strong will and power. You can maintain your own Дача, but you will fail to run Gorky Park on your own. There are a lot of things do in a community like Moscow. And so there are a lot of government agencies, in Moscow, in Russia, and in almost any country around the globe. E.g. police departments, schools, Mosgortrans (running public buses and trams), Mosmetro (running the subway system), and Мосгорпарк. This is what I do as an Assistant Professor of Public Administration at HSE: I am analyzing what government agencies do, how they do it, and why. Today I would like to share with you some new results about Innovation and Russian Civil Servants.